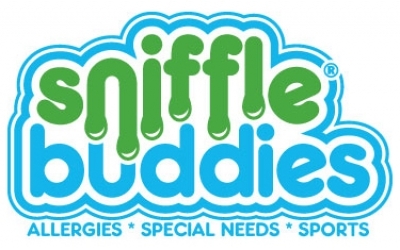 Sniffle Buddies, LLC was founded in 2009 by the Mom of an allergy-prone toddler. In an attempt to redirect her son's germy hands away from his face during playtime, J. Kelly Mayes created bamboo velour wristbands. The bands helped him independently tend his constant itching and sniffles without direct hand to face contact. These award winning Sniffle Buddies are hand assembled in the U.S.A. from 70% Viscose from Organic Bamboo / 28% Organic Cotton and USA made elastic and velcro. Each and every band is Mom inspected before they are sent to stores or to the families of our valued customers. Great for ALLERGIES / SPECIAL NEEDS / SPORTS!